Did you love Mr Nobody and the Brotherhood of Dada? The Painting that Ate Paris? Those were some of the wildest characters, the craziest stories, that Grant Morrison created during his time on the Doom Patrol. Well, if you enjoyed them as much as I did, you will wind up shouting out loud in delight at the latest issue of Doom Patrol. OK, I made vocal noises. You might not. I’m not judging you, though. OK, I am. If you haven’t figured it out by now, Mr Nobody returns in this issue. And we meet the new Brotherhood of…well, read it and find out. Gerard Way keeps a lot of balls in the air with this issue, actually. There are some interesting developments with Casey, aside from her quest for Lotion. Robotman and Jane have their own problems to deal with, as well. The story also very effectively jumps moods, in a way that probably would be jarring, were this not Doom Patrol. 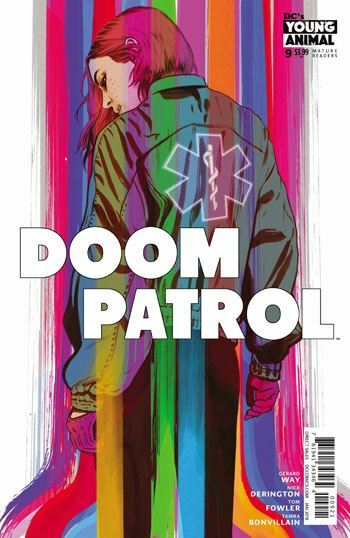 It’s strange to consider, but what makes a Doom Patrol story work really well is not necessarily what would make other team stories work well. I want wild digressions and to have the rug pulled out from under me every so often. It’s difficult for me to imagine how this all would read to someone unfamiliar with the team, though I expect if they had any sense of fun they couldn’t help but enjoy it. Still, for those who have been around, there are always great little gifts, like the t-shirt with Beast Boy’s image on it, in this one. 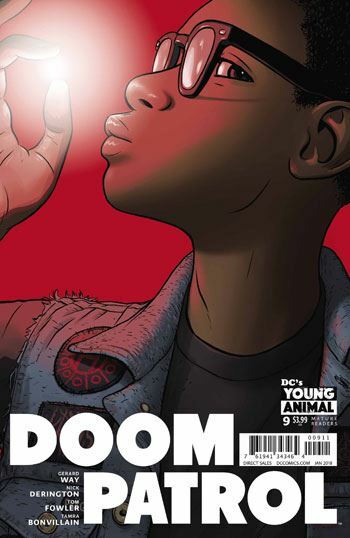 Read Doom Patrol. You know you want to.